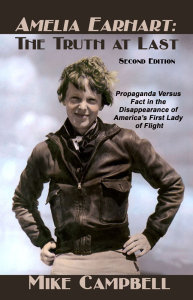 JACKSONVILLE, Fla. — Sunbury Press has released an updated second edition of Jacksonville native Mike Campbell’s classic Amelia Earhart: The Truth at Last, the seminal work about the fate of the famed aviatrix. Nearly everything the American public has seen, read and heard in the media for nearly eighty years about the so-called Amelia Earhart mystery is intentionally false or inadvertently misleading. The widely accepted myth that the disappearance of Amelia Earhart and Fred Noonan during their ill-fated world-flight attempt in July 1937 is among the greatest aviation mysteries of the 20th century is an abject lie, the result of decades of government propaganda that continues unabated to this day.